Project AWARE Foundation is a global, non-profit organization with offices in UK, US and Australia. AWARE supports a global movement of divers acting in their own communities to protect the ocean, with a focus on implementing lasting change in two core areas: shark conservation and marine litter. Dive Against Debris is a year-round, underwater debris and data collection effort. Divers are encouraged to report on locations, types and quantities of litter that they see and remove underwater. 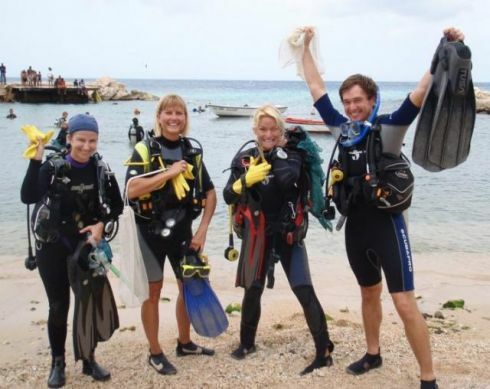 Divers wishing to participate are asked to choose a site that they are familiar with and where they find marine litter regularly and organize with friends to collect and report that litter. A training manual, a data card, a marine debris ID guide, along with other support tools, are all downloadable from Project AWARE website and divers report data into an online database. Divers are also asked to repeat the survey of their chosen dive site as often and as regularly as they can in order to help identify trends at their chosen location. Yes. Individual and corporate donations as well as grants. Dive Against Debris is a citizen science programme that Project AWARE has developed for scuba divers. It has the potential to provide critical information and data about marine debris underwater. Scuba divers are uniquely positioned to take action against debris. They are the first to see the devastating effects of debris underwater, they have the skills needed to remove litter underwater, and Project AWARE has provided them with a platform to report it – the Dive Against Debris database. The rubbish collected is categorised based on material of construction: plastic, glass/ceramic, metal, rubber, wood, cloth, paper/cardboard, mixed materials and other debris items. Individual items are then recorded within the relevant category using the Dive Against Debris Data Card and ID Guide. Information about survey location, dive duration, depth, number of participants and entangled animals encountered are also reported. To date, over 1000 Dive Against Debris surveys have taken place across the globe. In the first 6 months of 2013, 10,387kgs/22,900lbs of rubbish have been removed by 1618 volunteers, over 3500kg (3610kg is the exact figure) of which have been collected in European countries by almost 250 volunteers. The UK, Spain and Italy are the top three countries reporting data in Europe so far this year. While Project AWARE has made every effort to make the programme as accessible as possible to scuba divers, barriers to entry are high. Initial and ongoing funding for the Project was provided by project AWARE’s individual donors. Two grants help expand the database and revamp the materials. The initial start up cost was about 30,000 USD. Recent database and programme overhaul added another 20,000 USD. Another 10,000 USD is currently budgeted for the visualization of the reported data necessary to close the feedback loop and make the data widely available to anybody who needs it. The programme requires a day-to-day management equivalent to a full time staff but distributed among different staff members of AWARE globally. These assessments do not account for the time of volunteers, who organize the effort and report debris to AWARE online, nor for the time of the individual divers participating who collect, separate and record debris. Funding for maintenance and ongoing improvements to the programme will determine the project’s sustainability. AWARE is committed to improving and changing the programme as needed to be able to use the data to help stop litter at the source by changing local waste management practices and waste management policies locally, nationally, and regionally. How Transferable is the Project/ Activity to other European Countries/Seas? Very. The programme is global and materials can be made available in any language.